Wait until the bat lands. Cover the bat with a small container. Slip a piece of cardboard between the wall and the container, the bat should drop into the container. Take it outdoors and release it, preferably near some trees or other cover. If the bat doesn't fly out of the container — gently tip it out of the container in a safe place, out of the way of predators. For more information, watch Bat Conservation international's video on how to remove your bat. Please fill out our online Bat Report Form so we can document your bats in our statewide database. 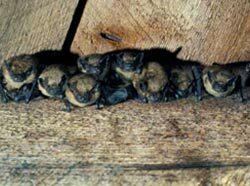 Human health is not generally at risk from bats in Alaska, although sometimes noise and/or odors from large colonies of bats can become a nuisance. If you have a large colony in your house it is likely a maternity roost. If a colony of bats in your house has become a nuisance, convincing them to leave can be difficult. Deterrents such as mothballs and ultrasonic devices do not work. Using pesticides and poisons on bats is illegal. Using pesticides increases the likelihood of having dead bats decompose in your house and also increases the chance of humans and/or pets coming into contact with them. Killing bats is not recommended and in many cases can actually be illegal in Alaska. Bats typically use multiple roosts during the maternity season, so killing the bats present at any given time will not prevent new bats from (re)occupying the building. Exclusion is the ONLY effective solution for permanently removing bats from buildings. 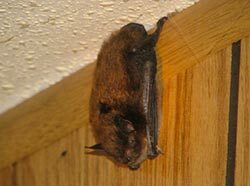 You can call a licensed professional or you can follow the “do-it-yourself” approach to excluding bats from your house. We recommend hiring a professional because they are licensed, experienced, and can keep you from accidentally straying outside of Alaska statutes. Excluding maternity roosts in Alaska should be done in late September or early October, when the pups are old enough to leave the roost and forage with the females. Examine the building for potential entrances. Common entrance spots include chimneys, vents, soffits, joists, and corners. Check for holes with staining and/or guano (bat droppings). The presence of guano on walls, floors, or the ground usually indicates an entrance is present somewhere above. Try to identify as many potential entrance holes as possible. Conduct a little "stakeout" of your place starting at dusk. Watch potential entrances to try and see where bats are exiting your building. If you find an active entrance, watch it for a few evenings to get an estimate of the number of bats. Once you’ve determined the locations of entrances, cover each with a one-way bat exclusion device. This is a device that allows bats to leave the building, but not return. Seal all other openings along your roof-line, attic, or other areas near exclusion devices. Leave your bat exclusion devices in place for a minimum of seven days to make sure all the bats have left. You can now remove the exclusion devices and permanently seal the entrances. Depending on what you decide to do about the bats in your building, your colony may be of interest to us as part of ongoing bat research and monitoring efforts in Alaska. We conduct exit counts at summer roosts to help monitor bat populations in the state. We also track activity through the fall to determine when the bats leave or if they remain in place over the winter. Let us know if you are interested in having your building included in our research. If you have any questions don't hesitate to contact us. Also please keep us posted on how you choose to resolve your "bat issue" and whether your exclusion is successful.